Hey, hello, hi! How was your Christmas? Was it delicious? Was it cold? Did you eat 300 sugar cookies? What are the odds? Me, too! Actually, have I ever told you the few days after Christmas are my least favorite of the year? There is no joy in those days. The tree comes down. The presents are all opened. The sky turns grey (at least in my world). Your family leaves with their cookies. I mean, isn’t it the worst? OK, maybe I’ve matured a little since 13. Not much, but a little. Now I know there is so much to look forward to after Christmas. For one, there’s New Year’s Eve and that inspiring task of coming up with new resolutions for the year to come (ours are coming soon!). You get to evaluate what you did in the year past, look ahead, and paint a picture of what you’d like to achieve. Now that’s just plain thrilling in my world. You know what else is thrilling? Sweet potatoes. 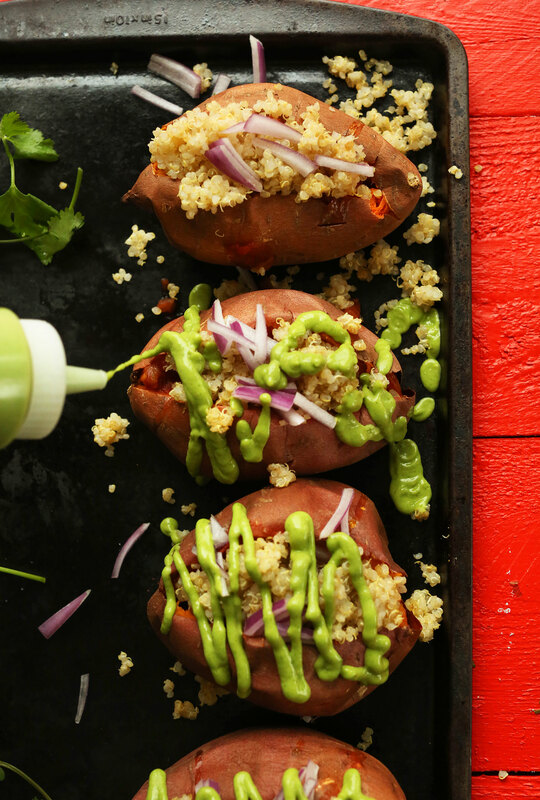 Specifically, sweet potatoes stuffed with quinoa and all the Mexican-inspired toppings. Get on board. This recipe is simple, requiring just basic 10 ingredients (give or take a topping). And it’s healthy, entirely plant-based, and gluten-free. Not to mention, it’s the perfect way to refuel the healthy way after a week of less-than-nutritious eating. While some people’s instincts may be to go the salad route after the holidays (no shame in that), I say a girl (or boy) still has to eat, so let’s fill up the healthy way, shall we? This would be an especially great meal to serve to lingering house guests, especially alongside some piping-hot soup. Serious yum. If you give this recipe a try, let us know! Leave a comment below, rate it (once you’ve tried it), and don’t forget to tag a picture #minimalistbaker on Instagram! We’d love to see your spuds in action. Cheers, friends! 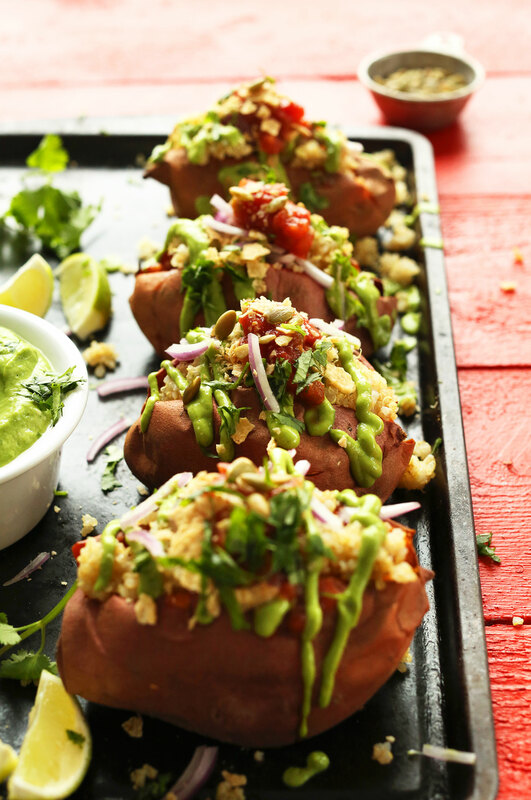 10-ingredient quinoa stuffed sweet potatoes with salsa, tortilla chips, and a creamy avocado-cilantro sauce! A hearty plant-based entree or side. Preheat oven to 400 degrees F (204 C). Poke a few holes in the sweet potatoes with a sharp knife to allow steam to escape. Once oven is hot, bake sweet potatoes directly on oven rack (with a baking sheet below to catch any drippings) for 45 minutes - 1 hour, or until tender to the touch. Time will vary depending on size of potato. In the meantime, heat a small saucepan over medium-high heat. Once hot, add rinsed quinoa and toast for 3-5 minutes, or until all water is evaporated and quinoa is fragrant and slightly toasted. Remove quinoa from heat and season with another healthy pinch sea salt and 1/4 tsp ground cumin (amount as original recipe is written // adjust if altering batch size). Stir, adjust seasonings as desired, and set aside, slightly covered. To prepare dressing, add all ingredients besides water to a blender or food processor and blend. Add only enough water to encourage blending. Scrape down sides as needed. Taste and adjust seasonings as needed, adding more lime, salt, cumin or sweetener as desired. Set aside. Prepare any remaining toppings, such as chopped onion, cilantro or crushed tortilla chips (optional). To serve split open baked potatoes and gently press in on both ends to allow room for toppings. 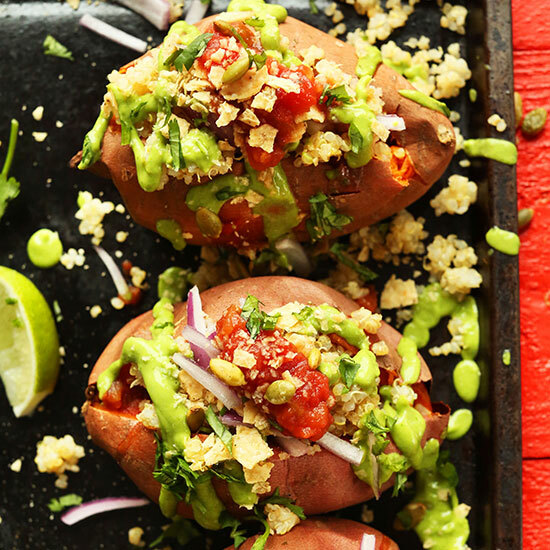 Fill each potato with 1 Tbsp salsa, and 1/4 - 1/2 cup cooked quinoa. 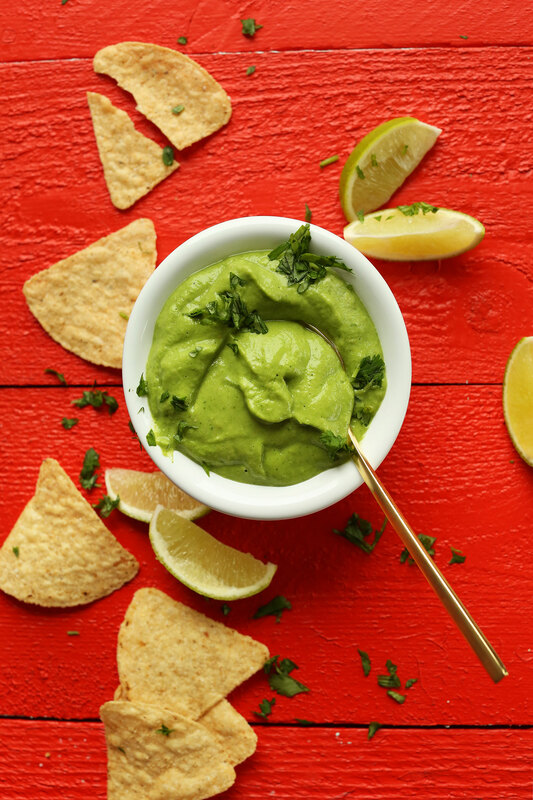 Top with a healthy drizzle of avocado-cilantro sauce, and any other desired toppings (hot sauce, extra cilantro, and tortilla chips being my favorite). Best when fresh, though leftovers store separately in the refrigerator up to 2 days. *If you aren't a big fan of quinoa, simply sub cooked black beans, seasoned with cumin, sea salt, and chili powder to taste. *Avocado cilantro sauce slightly adapted from my Mexican Salad Cups with Cilantro Dressing. *Nutrition information is a rough estimate calculated with dressing and without tortilla chips or pepitas. My daughter and I made this over the holidays. Our table was never so quiet, because everyone was eating like they hadn’t eaten all day. 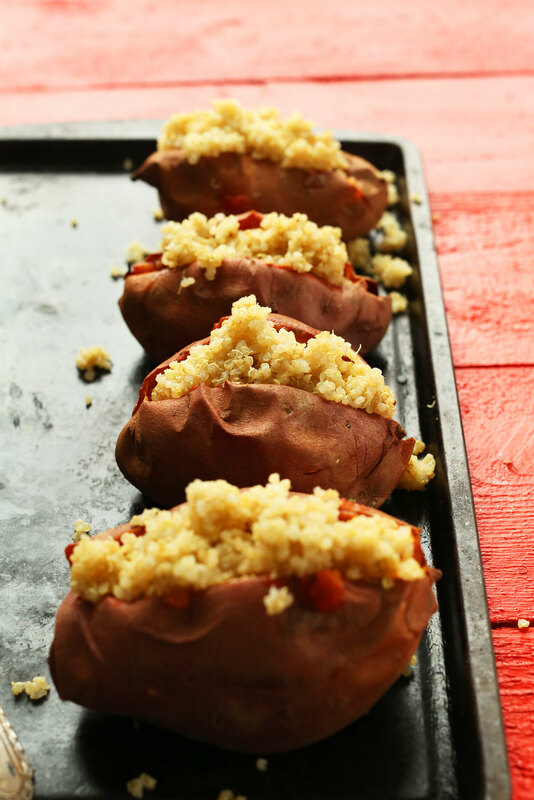 Fully enjoyed this Quinoa Stuffed Sweet Potato recipe Dana. The flavour of the avocado cilantro sauce and lime juice was a perfect topping. (We made a double batch of the sauce before serving, after my daughter did a taste test.) Thank you for this delicious combo. This was very delicious. I swapped out the regular sweet potatoes for purple sweet potatoes. Omg it looked sooo amazing and colorful with the avocado-cilantro sauce! I also opted out of using onions (I’m not a huge fan especially when raw) and used pineapple salsa which was delicious. I subbed in about 1/3 of the quinoa with a 15oz can of black beans. 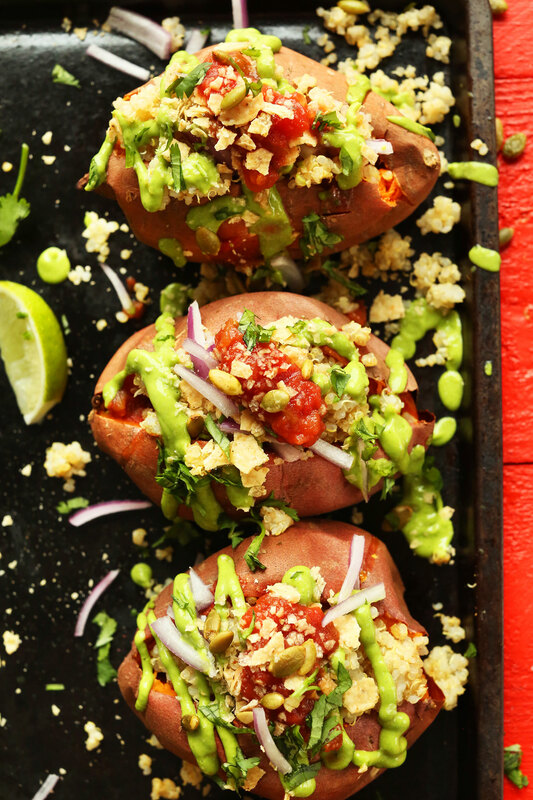 I also topped half of my sweet potato with your Chipotle Red Salsa along with the avocado! The sweetness of the potato balanced out the heat of the salsa perfectly! Thanks so much for this amazing recipe. How long can the dressing last in the refrigerator for? Will it brown significantly? Tying to make this recipe in a large batch for meal prepping! Thanks. Hi Rosalie! Best when fresh, though leftovers store separately in the refrigerator up to 2 days. hi! i have a question,would it also be good if i substituted half the quinoa for black lentils, thanks! Hi! We haven’t tried it, but if you do let us know how it turns out! i made it with the black lentils and it was very good! I have made many of your recipes and I have never been disappointed. This one was one of my favorites! It is so filling, and my husband has been loving all the flavors in each dish. Thank you for making all your recipes available. Hi Tash! It shouldn’t brown too quickly as the lime juice will prevent that from happening! I was looking for a recipe on some different way to prepare sweet potatoes. I was so stuck with always baking them, I’m definitely going to try your recipe soon. 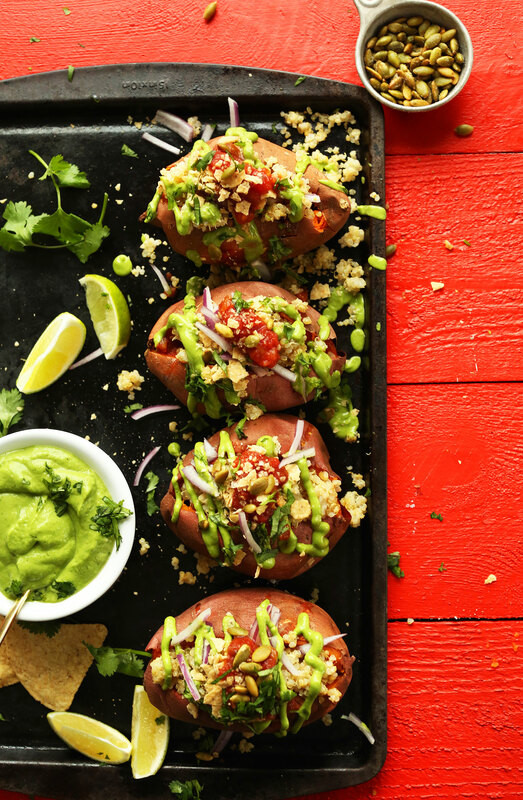 They look amazing stuffed with quinoa! I’m hungry now ha ha. Thanks! Hmm, I just checked and it was up. Perhaps it’s on your end? I just tried it again and it worked. Thank you Dana! Amazing recipe! I know I’m late to the party, but I love browsing your archives. Where do you get the sauce squeeze bottles? So much nicer than glomming it on with a spoon. Thanks! These were SO good! I zested a few of the limes and it kicked up the flavor even more. Even my meat loving husband went back for seconds. Yum! WOW!! I made these for dinner tonight, along with the black bean soup you mentioned. I used both regular sweet potatoes and purple Japanese ones. Insanely flavorful and delicious! I also made some pico de gallo with shallots for the topping. The avocado-cilantro sauce is incredible and I will be making that every time we have Mexican food from now on. Thank you for sharing these wonderful recipes!! Awesome!!! I loved your recipe!!! Thanks so much for posting! Just made these – it’s so yummy!!! The avocado lime dressing is mind-blowing, I could eat it with a spoon. This recipe was super easy, delicious, and makes great leftovers! We may be adding the sauce to pretty much everything from now on. I just made this and all my BF and I can say is YUM. Thank you very much, it was fantastic. I LOVE THIS RECIPE. It has become a weekly staple for me. I actually crave these guys. I don’t like cilantro, so I subbed parsley here. It worked beautifully. Really incredibly good! (I added black beans, cooked with garlic and cilantro) I don’t know how well they did to make up for holiday eating because I couldn’t stop at just one! Delicious, filling, and easy to make! Made this tonight with my husband and it was AMAZING (although my presentation was disappointing compared to yours haha). So much flavor, and so filling that we didn’t even need a side with it. I threw my sweet potatoes in the microwave for 5 minutes or so before I put them in the oven and still baked them for the time recommended and they were perfect. – THANK YOU! These are SO DELICIOUS! I did not think I even liked sweet potatoes except in the french fry form but this recipe has really changed my mind. I’ve made the lazy girl version mostly: I just mash up avocados ala guacamole, add in some salt and pepper. I have from quinoa that has kale mixed in that I pop in the microwave then add to the potato with salsa. SO EASY and delicious. Thank you, Dana for the inspiration! This one rocked. My toddler loved it! Definately going to try this. Sounds awesome!!! Thanks Dana. I made this today for brunch and it was DELICIOUS. I’m excited to try the other recipes on this site. i just wanted to say i am SO very grateful for your website, recipes and all that you do. we are a vegan family of six and your site has given us SO many recipes and delicious things to eat. my sister and her boyfriend are also vegan and i am buying her (and my family) your cookbook. i can’t wait to get it once it’s out!! so thank you so much for cooking and creating these recipes. we love them! my mom also cooks from your website and your recipes. :) and even my oldest son, a 15 year old teen, has been won over to the vegan lifestyle. your cheesecake is his favorite!! :) happy new year to you both!! We made this for friends who want to eat vegan in 2016. We all cleaned our plates! We all agreed that it could use a nice scoop of savory black beans to mellow out the sweetness of the potato, the acidity of the dressing. But overall, it beats a tired meat-centric dinner any day! Go plants! Thanks for sharing! I hesitated to add beans because, well, it’s been done before. But of course, it would make a lovely and nutritional addition! I was just drooling over this recipe, thinking about making it tomorrow, while sipping a hot hot cup of rich drinking chocolate spiced with cayenne….mmmmm dinner then dessert…..
OMG. So good! We had mangoes around, so we added some to these babies too. Thank you! Lovely addition! So glad you liked it, Ashley! Any suggestions for a similar sauce but without the avocado? My partner is sadly allergic. Hmmm. I think I’ll bake some sweet potatoes, and use my left over stuffing from the Mexican stuffed peppers for this recipe. Add some tortilla chips, and that’s dinner ready! 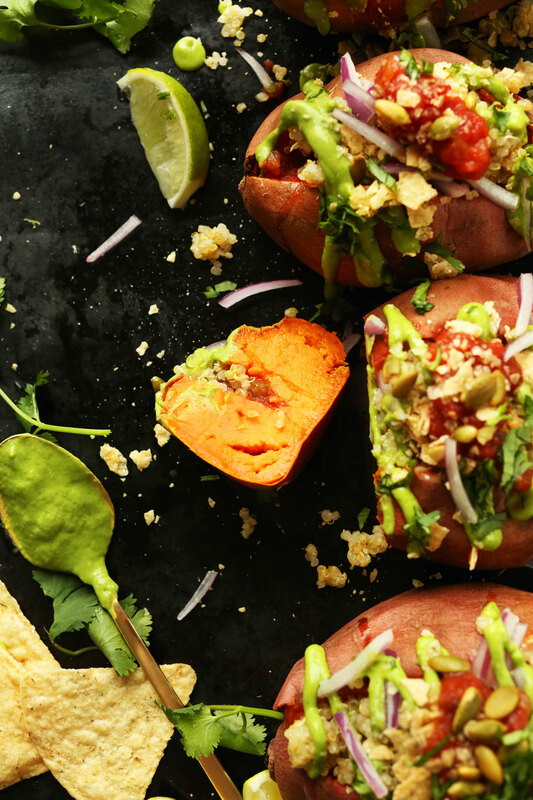 Great way to incorporate sweet potatoes! Saw it in my inbox, tried it (give or take a topping or two – I added some left over roast pumpkin), and loved it. I had to go dairy -free for my health, but you, Dana, are rapidly turning me into a vegan. Ha! Not my intention, but it if it happens it happens! Thanks for sharing, Kate! I love sweet potatoes and quinoa! This is great! That sauces looks SO dreamy creamy! A lot of my meals are just, “hey, I’m going to make this and stuff it into a sweet potato.” Easy peasy! I think I’m going to love these potatoes too! And I definitely ate a million sugar cookies so this sounds perfect. Yum! Guilty of sugar cookie eating here. Gingerbread man cookies. And the spritz ones. Gained a bit of ole weight! Oops. But have tons of sweet potatoes and know exactly what to do with them now. Yummy yum yum in my tummy tum tum.